Sarah Sky is a freelance education journalist and lives in West London with her husband and two young children. She grew up in Sutton Coldfield, West Midlands, and studied English at Nottingham University before gaining a post-graduate diploma in journalism at Cardiff University. She trained as a journalist at the Western Daily Press in Bristol. Her highlight was interviewing screen legend Charlton Heston and lowest point was being sneezed on by a cow at a fatstock competition. Sarah worked as an education correspondent for a national newspaper before going freelance. She now divides her time between journalism and writing. She loves reading, martial arts, baking and table tennis and hates cows. Chat to Sarah on Twitter @sarahsky23. 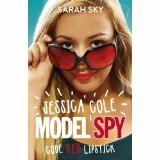 Code Red Lipstick (Model Spy Book 1): Jessica Cole is just your average teenager, except when she’s strutting down the glamorous catwalks of Paris. When her father, a former spy, vanishes mysteriously, Jessica takes matters into her own hands. She’s not just good at striking a pose, she’s going to take on MI6 and beat them at their own game. Following her father’s trail, Jessica’s investigation lands her hot on the heels of a deranged former supermodel, Allegra Knight, who plans to unleash mayhem on an unsuspecting teenage population with the launch of her new miracle face cream, Teenosity. 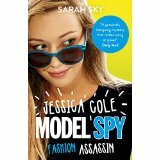 Fashion Assassin: Supermodel Jessica Cole has no intention of ever spying again after she was nearly killed by an embittered ex-model and a rogue MI6 agent. That is until she’s blackmailed into posing undercover as bodyguard to a ve ry rich fellow model. What seems like a simple job aboard a luxurious yacht in Monaco soon turns into a deadly mission to stop the most dangerous weapon in the world falling into the wrong hands. Jessica will need every gadget in her make-up bag if she wants to get out of this one alive. Catwalk Criminal: Jessica Cole has been recruited to Westwood, MI6’s secret division of supermodel spies. Her first official mission seems simple at first, until it turns into the bigges t cyber-attack ever known, threatening the security of the whole country. Then it emerges there is a traitor in the midst at MI6 – and suddenly Jessica herself is being accused. With no one believing her innocence, and the country on the verge of chaos, Jessica has no choice but to take matters of national security into her own hands and catch the culprit – fresh from the catwalk.